Zoning can regulate the use of land; size, height, bulk, erection, removal and use of structures; areas and dimensions of lots, yards, open spaces & separation distances between structures; density of population and intensity of use; and protection of natural resources and agricultural land. To protect and enhance the value of land. Below is a list of municipalities in Mercer County that have locally adopted Zoning ordinances. 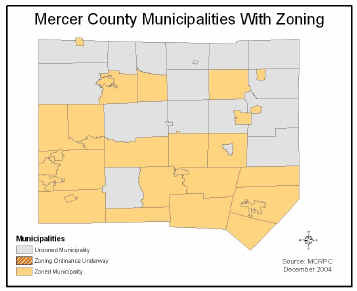 Presently, 30 out of 48 (63%) municipalities in Mercer County have zoning. The following ordinances, and links are to be used as reference material only. The MCRPC recommends that individuals contact the local Zoning Officer for specific zoning questions.